Dayna Potoczek gets a big smile from 3-month-old Esther. The caravan of baby strollers provides the first clue that this is not your typical weekday meeting at Akron Children’s Hospital. Every Wednesday morning at 11 a lively group of new mothers – with their babies and toddlers in tow – gathers for an hour-and-half breastfeeding support group led by lactation consultant Liz Maseth. The women come to support one another, nurture friendships and, in great part, because of Liz. The breastfeeding support group meets every Wednesday at 11 am at Akron Children’s Hospital. She gives them the encouragement and sound advice they need to succeed at breastfeeding. “I would have stopped nursing after a few weeks without Liz and this group,” said Sarah DiBenedetto. The mother to 4-month-old Anna Sophia had breast reduction surgery 10 years prior to her pregnancy and this contributed to a slow start in nursing in her daughter. Several women had latch issues and admitted that, without proper technique, breastfeeding can initially be painful. They didn’t want such an easy out. 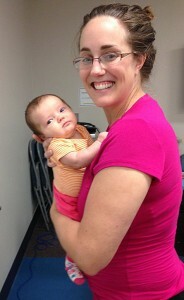 Jennifer Buckholdt is a proud mother to 3-month-old Sophia. They wanted to talk to other new moms having similar issues and needed a breastfeeding advocate like Liz, who nursed all of her children and has devoted her 36-year nursing career to supporting mothers faced with breastfeeding challenges. This was frustrating for the college professor used to getting lots accomplished in each day. Liz identified Heather’s daughter, now 8 months, as a “connoisseur” who just likes to take her time nursing. Upon Liz’s advice, Heather began weighing Harper and tracking her intake, which gave her assurance Harper was getting what she needed and made her a more confident mother. The women have bonded beyond the initial issue that united them. They discuss making and sharing their own baby food, similar to a holiday cookie swap, and plan outings with their kids. They still laugh about one trip to the zoo this summer. They were almost stranded with the animals amidst torrential winds, rain and flooding. They swap advice on introducing their toddlers to new foods and where they can find public facilities friendly to breastfeeding moms. Babies R Us, Cedar Point, Blossom Music Center and Belden Village Mall all got praise in that regard. Liz, the unofficial grandmother of the group, knows which kids have had birthdays and which women are heading back to work after maternity leaves or summer breaks. It’s a difficult time of transition. A few women – with older children – come back as a way to keep in touch and pay it forward. 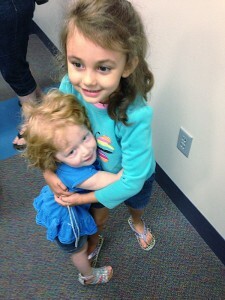 Lola Maxwell and Adysen Wills have fun playing while their moms socialize. Kathleen Wills persevered and continued to nurse her first baby, Adyson, on one breast after developing mastitis, which turned into an abscess that required surgery. Breastfeeding went much more smoothly the second time around with Ayden. Despite these struggles, the women are strong supporters of breastfeeding. They note that their children are very healthy and don’t seem to get many colds. It’s convenient and they save money as formula is costly. Several of the women supplement with formula once their milk supply is well established. They could all cite studies that show the many benefits of nursing to baby and mother. But, most of all, they treasure the closeness and the special time it gives them with their babies. After a few tears, sleepless nights and anxiety-filled days, one way or another, they all found Liz. “A reason to put clothes on and leave the house,” said Kierstyn, with a big smile. 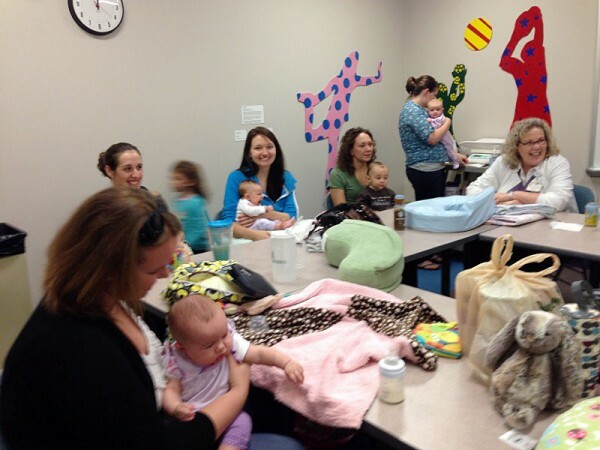 The breastfeeding support group is free to participants and is one of the many community benefits Akron Children’s provides as part of its advocacy efforts on behalf of children and families. For more information, contact Liz Maseth at 330-543-4531.